Wearable biometric devices are becoming more prevalent. Whether or not the are they becoming more accurate, and so more useful, is still debatable. We tested one such device, the Healbe GoBe2, to find out how helpful it might be. The GoBe2 is a wrist-worn device, resembling a blank-faced oversize wristwatch, with a readout available when the single control button on its side is pressed. 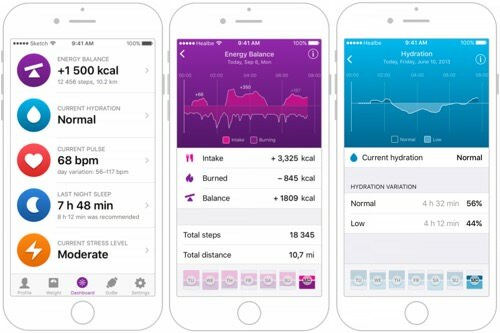 Five data modules record energy inputs and outputs, hydration levels, resting heart rate, sleep activity, and stress levels. Additional information is provided for steps taken, distance covered, and macronutrient analysis. 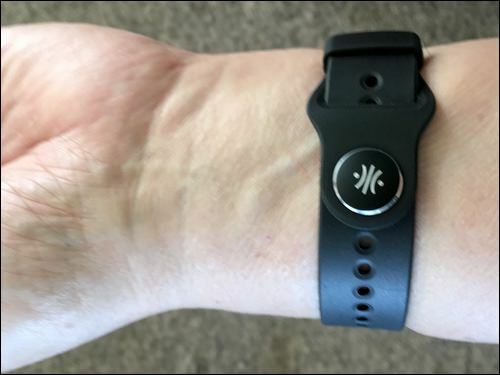 The collected data is sent from the wrist-worn device to a mobile app over a Bluetooth connection and to an online personal account over an Internet connection. The GoBe2 wristband will display some current data on its face if the single control button is pressed. Seven days-worth of data retained for viewing on the mobile app. The full recorded data set will be available on a web portal following registration, which can only be done on the mobile app. Once a week, registered users receive an emailed summary of their data. 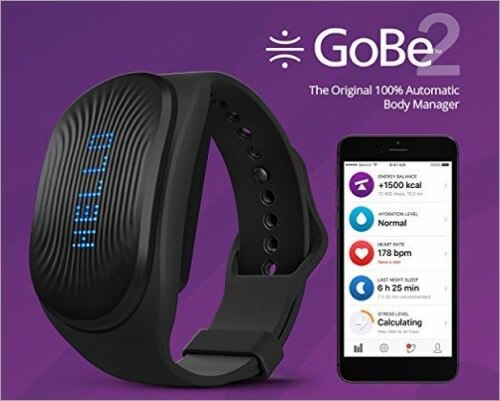 GoBe2 is compatible with Apple Health, Google Fit, InKin Social Fitness, and Withings Smart Scale (we only tested the Apple health linking, which worked as expected). We used the GoBe2 to gather biometric data and ran it concurrently with a proven, traditionally calculated biometric regime. The pre-existing method used energy input calculations from an online service offering Calorie counts. The unit of measurement sometimes called a ‘food calorie’ is also known as a ‘large calorie’ or ‘kilocalorie’, abbreviated to ‘kcal’, or ‘Cal’ with the initial letter uppercased. 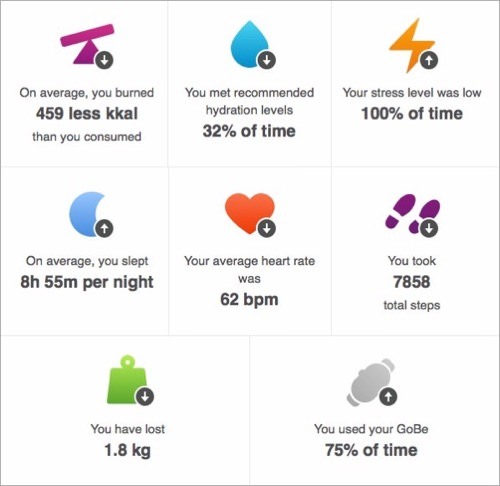 Gobe2 uses ‘kcal’ to avoid confusion and this review will now follow suit. Pre-existing method energy output data came from the console of a recumbent static bike (RSB) with an on-board console readout. A daily kcals deficit was calculated from food intake minus BMR (basic metabolic rate, using the conservative Mifflin St Jeor formula at a sedentary level of base x 1.1) and also minus the RSB console reading. Comparisons of other metrics were taken from user-reported observations. Does it work? The developers raised over $1million through Indiegogo for crowd-sourced seed funds. Testing of an early GoBe model by the Saint Petersburg State Institute of Health concluded that its tests showed that the GoBe measured calorie [sic] intake within an average error rate of 15.6% and measured calories [sic] burned during routine activity within an average error rate of 6.6%. Nevertheless, the GoBe was heavily criticized online. The developers persevered and GoBe2 is the result. The GoBe system is almost a year into a five year assessment with UCI Davis. There have been GoBe2 firmware updates issued to improve performance and accuracy. How does GoBe2 collect measurements? The online manual is easy to read and we suggest you click to expand all the sections and skim all the way through to get an overview. 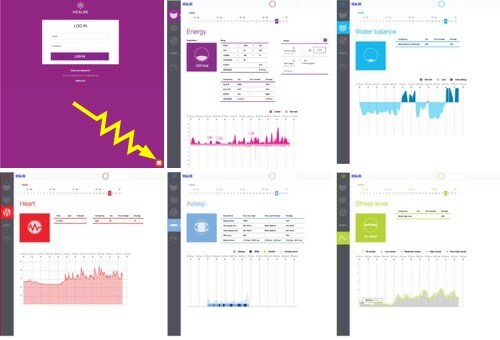 For those who like detail, links from the module sections of the manual explain the methodology for the measurement of energy intake, energy expenditure, levels of hydration, patterns of sleep, heart rate, levels of stress, and emotion. How is the data presented? The time, system status, and a subset of the available biometric data are available by pressing the single-action button on the side of the device. Such short-term biometric data is only minimally useful. Monitoring biometric data has to be a long-haul operation if it is to be meaningful. The GoBe2 mobile app and web portal offer that service. Our testing experience: The GoBe2 was worn for the last three days of the week in which it arrived as a settling-in period, and thereafter continuously. Check with the above image and caption for an approximate sizing guide, shown with the end of the strap just inside the retaining tab and four adjustment holes remaining available without the tab. We monitored three weeks of data measurement, wearing the GoBe2 wristband at all times, including while showering, but with the exception a one-hour daily charging session. The device must be worn in close contact with the skin. It will give you a haptic buzz and a flashing visual reprimand if you fail to comply, so no loose bracelet-style wearing. However, despite having not worn a a wrist watch for several decades, the GoBe2 wearing experience was unproblematic and comfortable for our tester. The results: Our conclusion was that the data from the GoBe2 is not directly comparable with the data collected from the existing, traditional method. That said, the data is useful. The way traditional data is assembled makes it look more accurate and reliable than it really is. Take a bathroom scale as an example: the results are so variable that one popular diet plan mandates no body measurement, including weighing scale use, for the diet’s thirty-day duration. Similarly with GoBe2: it is the overall, longer-term data that is useful. In the shorter term, the device is motivational in keeping the user reminded of the goals that if met will result in meeting an overall goal of maintenance or change in user biometrics. Checking daily progress is useful for learning how such biometric responses are responding to inputs and behavior. Unlike gym memberships, which tend to languish after the initial enthusiasm and determination wear off (aka mid-January), most owners of wearable devices continue to use them daily, according to a survey by Researchscape International on behalf of the Healbe Corporation, the makers of the GoBe2. As the data from the GoBe2 accumulated, we were able to gain insights into wearer-biometrics. 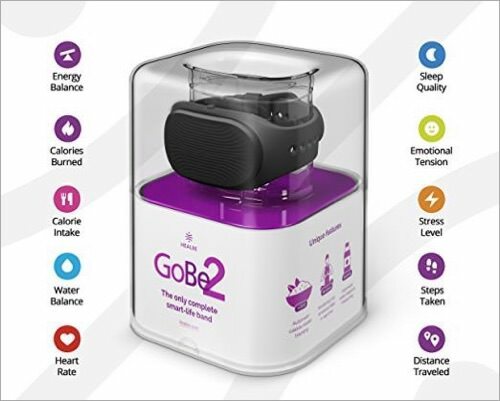 In the absence of other routine monitoring of energy balance and hydration, the GoBe2 will be an easy and dependable way to check if such monitoring needs to be implemented. The weekly summary of energy input (aka food in the anti-jargon world) was within fifty kcals of the traditional calculation method, although it bears repeating that short-term GoBe2 data was at variance with the intervals of a traditional measurement system because it is a different data collection method. Visit the GoBe2 blog for detailed guidance and tips for getting the most out of the device. The energy output-monitoring module (aka basic metabolic requirements plus exercise) uses an accelerometer to measure energy used: the tester’s RSB (recumbent static biking) exercise was not measured—no arm swinging defeats most fitness monitors, and even specialist foot monitors are prone to error because the motion is as much horizontal as it is vertical. The easy solution was to use the console information from the RSB and add it to the GoBe2 output data. Steps walked and distances covered were as accurately recorded as these data can be by a consumer level wearable device. The data from the hydration-monitoring module must be understood as a measure of the fluid retained in the wearer’s body, not the amount ingested through drinking: an intense exercise session will show as dehydration because the body is depleting the cells of water as part of the process of changing chemical energy into mechanical energy. The HRM (heart rate monitor) module is a resting-rate monitor, not a replacement for HRMs used to measure exercising heart rate. That is not a shortcoming. Resting heart rate is a good indicator of the essential process by which the body recovers and is also a measure of fitness. 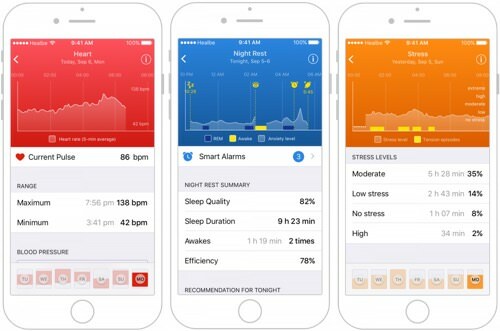 The sleep-monitoring module provides useful additional information that may help to explain why on some days you experience otherwise unaccountable fatigue. Users with sleep concerns, especially CPAP (constant positive airway pressure) wearers, will not be disappointed in the data. The stress-monitoring module may also hold some surprises: the test subject was able to relate specific incidents to the recorded data as user-observed confirmations. Review conclusions: Because GoBe2 development is ongoing by the Healbe Corporation, and also because the ROI (return on investment) is dependent on user involvement and willingness to use the data properly, we found it difficult to give a MyMac rating as we usually do. Everything works as claimed. The test subject for this review will continue to implement traditional monitoring in addition to GoBe2 usage as a useful additional tool. Review rating: In such a context, a high rating would be appropriate for those who are serious and dedicated to improving their health and fitness—the answer to the question posed earlier is: “Yes, this device could help a user with lifestyle decisions and management.” Potential users seeking instant erudition, a quick fix, or a shortcut to health and fitness, may find the GoBe2 a disappointment. It’s your call.